Nobody thinks they’re going to be a lampshade maker when they grow up. It’s one of those niches you expect to be filled by some anonymous worker on an assembly line. But for Judy Lake, “The Lampshade Lady,” it’s both a craft and an art. Lake is the proprietor of a little pink-painted studio/shop — aptly called Lake’s Lampshades — in Pawlet Village, Vt. She sells her own finished, rewired vintage lamps, as well as shade frames, hardware and fabrics for DIYers or shoppers who want a custom job. This month, Lake released her first book, The Lampshade Lady’s Guide to Lighting Up Your Life , which includes directions for nearly 50 different lamp projects — including the wiring bit — and a generous resource list. She is, in a word, passionate about lamps, and has parlayed that into a livelihood. Her own first entrepreneurial rush came in seventh grade, “when the macramé craze grabbed hold of me,” she writes. A local store in her hometown of Portland, Me., bought everything she’d made, transforming Lake from mere junior high hobbyist to a bona fide artisan. She began to study textile arts. By the time she graduated from the University of Vermont in 1981, with a studio art degree, Lake had an educated view of her field that was also informed by the “hundreds of craft shows” she’d attended with her mother. What she saw and learned during a Scandinavian year abroad continues to influence her sense of design, she says. That may not explain “Duncan’s Cowboy-Boot Lamp,” pictured in Lake’s book, nor the shade made from 1950s floral tablecloths. The former is a lamp (named for her son) with an actual worn boot for a base and some nifty Lone Ranger cloth on the shade. That and the tablecloths, hankies, chenille bedspreads, embroidered towels and other vintage fabrics that overflow the shelves at Lake’s Lampshades indicate her fundamental M.O. : Find old stuff at flea markets and yard sales and repurpose it. Lake was an “indie” crafter before the term became hip. In 1985, Lake moved with her husband to a tiny town in southern Vermont and got pregnant. That might sound like a career killer, but Lake says the changes gave her a few years to “figure out what I wanted to do with my life.” Familiar with the craft-fair circuit, she thought about what she could make and sell. Then, one day, someone told her “to do one thing and do it well.” With that advice in mind, Lake began to focus on shades — “I didn’t need a lot of upfront money, and I could do it when my son was young,” she explains — and began to work her way up the “food chain” of craft events. Lake, now 50, concedes that finding the self-confidence to start her own retail business took “a long time.” But in 1996 she opened her store in Pawlet, where she holds classes for all ages. (WhistleStop Antiques co-owner Mary Heinrich Aloi in Burlington is a recent “graduate” who now makes and sells her own shades through a new enterprise called Vintage Inspired.) Three years ago, Lake bought the “cute Cape” that she says was built in 1790. “I have it painted purple inside,” she notes. “Very funky.” With the publication of her book, the Lampshade Lady turns up the lights. 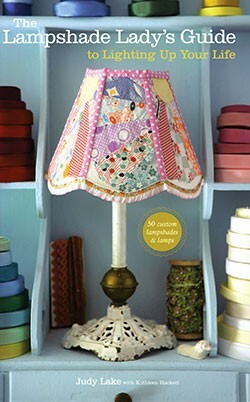 The Lampshade Lady’s Guide to Lighting Up Your Life by Judy Lake with Kathleen Hackett, Potter Craft, 160 pages. $27.50. Judy Lake hosts a book signing and demonstration this Thursday, August 27, at Northshire Bookstore in Manchester, 7 p.m. On Sunday, September 6, she’ll sign books at her shop at 60 School Street in Pawlet Village, 10 a.m. – 5 p.m., in conjunction with Art on the Green.